In 2016 VOA showed readers what the cherry blossoms look like in Washington, D.C.
One of the most popular events in Washington, D.C. each year is the National Cherry Blossom Festival. It takes place in early April. People from around the world come to see the beautiful pink and white blossoms on almost 1,700 flowering cherry trees. Cherry blossoms are one of the most popular attractions in Washington, D.C. each spring. 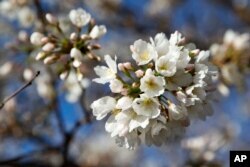 The city’s first cherry trees were a gift from Japan to the United States in 1912. About 100 of them are still alive. They are planted in Southwest Washington, along the Potomac River and a body of water called the Tidal Basin. The cherry trees are a short walk from a number of major monuments, like the Lincoln Memorial, Jefferson Memorial and Washington Monument. Over 1 million people travel to Washington each year to see the trees. However, there is a small problem. The weather in Washington has been unusually warm the past few weeks. On March 1, the temperature rose to about 27 degrees Celsius! Small buds can already be seen on the cherry trees. These growths will turn into flowers sooner than usual. In fact, this may be the earliest year ever for cherry blossoms. Experts say the trees will look their best between March 14 and March 17. The U.S. National Park Service says that may break the record of March 15, set in 1990. Many people would like to see the blossoms come later. The cherry blossoms are fragile. They do not last long and easily break apart. High winds or a heavy rain storm can knock them off the trees. That is why there are still a lot of springtime events planned to celebrate the ties between Japan and the United States. If you like things that fly high in the sky, there is the Blossom Kite Festival on April 1 and 2. And the National Cherry Blossom Festival Parade will take place on April 8. Dan Friedell wrote this story for Learning English. His report was based on information from the Associated Press and the Washington Post newspaper. George Grow was the editor. Do you think the cherry blossoms will come early this year? We want to know. Write to us in the Comments Section or on our Facebook page.